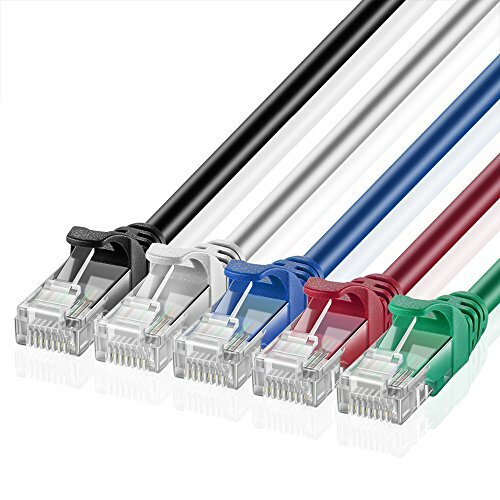 Category 6 cable, commonly referred to as Cat 6, is a standardized twisted pair cable for Gigabit Ethernet and other network physical layers that is backward compatible with the Category Cat5/Cat5e and Category 3 cable standards. Compared with Cat 5 and Cat 5e, Cat 6 features more stringent specifications for crosstalk and system noise. The cable standard provides performance of up to 250 MHz and is suitable for 10BASE-T, 100BASE-TX (Fast Ethernet), 1000BASE-T/1000BASE-TX (Gigabit Ethernet), and 10GBASE-T (10-Gigabit Ethernet). Ultra Slim and multi color coded, customized to improve the look of your home or office; Provides exceptional transmission performance and low signal losses. It supports up to 550 MHz and is suitable for Fast Ethernet, Gigabit Ethernet, and 10-Gigabit Ethernet.